Also shown in this 6 degree by 4 degree field of view are several other northern galaxies. Immediately above and almost touching M81 is its satellite galaxy, Holmberg IX. Above M81 and M82 is the Seyfert galaxy, NGC 3077. It is a member of the M81 group of galaxies. To the lower left of M81 is NGC 2976, an unbarred spiral galaxy. 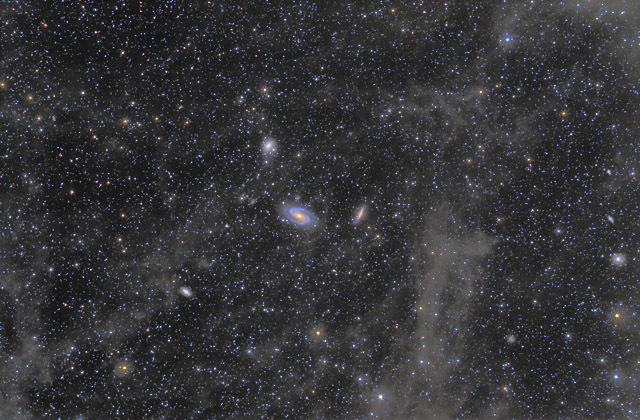 On the far right edge are two more galaxies, NGC 3077 (top), an emission line galaxy that is also a member of the M81 group, and the spiral galalxy NGC 2985. Because the IFN is so faint, I photographed this widefield image for a total of 17 1/2 hours with my 200mm Canon lens. Then, in order to show better detail within M81 and M82, I composited the widefield image with images I previously captured through my telescope. For M81, I used 9 hours of telescopic data, and for M82, I used 2 1/2 hours. As such, this image represents a total of 29 hours of image capturing! Software Used Images Plus 5.0 for camera control, calibration, stacking, digital development, star shrinking, smoothing and noise reduction. Photoshop CS5 used for levels and curves, high pass filter, star shrinking, screen mask invert, lab color, saturation adjustments, selective color, and match color. Gradient Xterminator for gradient removal. Carboni Tools for additional noise reduction, and smoothing. Registar for aligning stacks and composites and for color channel alignment. Notes I'm extremely happy with how well this image looks. Knowing that the IFN is quite faint, I wasn't sure that my skies were dark enough to capture it at all. When I first combined all my data, I was concerned because the IFN was barely visible. However, using a handful of processing tricks, I was able to coax it out of the background and show this beautiful feature of the northern sky. This image represents my deepest image to date - the base image is 17 1/2 hours with a very fast lens (f/3.5). I truly enjoyed this target, as it was very challenging to bring this image together. This image was published by Astronomy Magazine as its Picture of the Day for April 7, 2016. 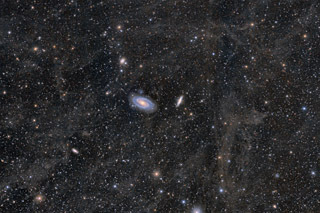 This image won 1st place in Astrophotogallery.org's Easy - Widefield category for February 2013. My friend, Blair Macdonald, used the data from this image for his article "Imagers Corner-Multi-mask Stretching" in the August 2014 issue of The Journal of The Royal Astronomical Society of Canada. In this article, Blair demonstrated techniques for bringing out very faint features in astrophotographs.